Technologies like Augmented Reality and Virtual Reality are perceived as the technologies of the future. Even though these groundbreaking technologies came into existence many years back. Integrating these technologies into standard processes can optimize and improve efficiency, resulting in better ROI (Return on Investment). The perception about these technologies being expensive to integrate into procedures is quite common. Availability of economical devices, as well as AR/VR enhanced content is a critical factor for organizations to discover the applications and use them to get better ROI. One such use case is integrating AR in training and development material. AR technology came into the limelight after the Pokémon go mobile game. This image superimposing technology can be integrated into all the employee training and development programs initiated by an organization. Augmented Reality technology can add an additional layer of information over the actual image. This layer is visible when a spot is viewed through either an AR-enabled smart device or a dedicated AR headset. How to Integrate Augmented Reality in Corporate Training? Organizations can integrate AR in their training material with the assistance of digital publishing platforms that offer the capability to enhance content by integrating 3D models over the content. AR content is displayed when the user’s device is at a certain location or when a user wearing an AR headset. What are the Applications of Augmented Reality in Corporate Training? Why is AR in Training a Smart Investment? Besides eLearning modules and courseware, completion of which is directly linked with an employee’s job responsibilities and appraisals; employees aren’t interested in training modules based on outdated technologies. Integrating gamification in training material can change the attitude towards training. Gamification is quite an expensive alternative. Also, gamification of every module may not be possible. Integrating AR in training and development for employees is comparatively economical and has a better cost to benefit ratio. Flexibility is one of the inherent features AR provides to employee training. AR-enabled content can be viewed and engaged with on any smart device having an AR application. This flexibility can prove advantageous to organizations as they don’t need to invest in dedicated equipment to view the content. Employees can use their mobile devices to view their content. Unlike Virtual Reality which requires dedicated headsets and supporting workstations to power them. The content can even be reused/repurposed to display concepts repeating in different modules. The organization can also create BYOD employee training and development policy arrangements due to the flexibility of the AR technology. The motivation for organizations providing employee training and development programs is to develop the decision-making skills of employee and train them for worst case scenarios. AR in training can be an effective tool to develop skills when compared to other training material. AR can blur the lines between virtual information and real-world which results in the delivery of contextually relevant and engaging learning experiences. When compared to gamification AR can deliver practical experiences to learners resulting in better engagement and retention. AR in corporate training is deployed in applications, enabling AR content to easily assimilate into the existing training process. In simpler terms, all the AR-enabled employee training material is delivered through AR applications. The data is hosted in secure cloud storage. Enabling any smart device with an AR application to access the AR content. The Applications are integrated with the organization’s existing Learning Management System. This integration allows the training; Learning and development managers to distribute AR-enabled courseware from LMS. Managers can also track content consumption and distribution from the analytics. The organizations need not invest in updating the IT infrastructure making this entire procedure a cost feasible alternative. Integrating AR in training is a cost-effective option to create and deliver employee training and development material. When compared to methods like gamification and Virtual reality. 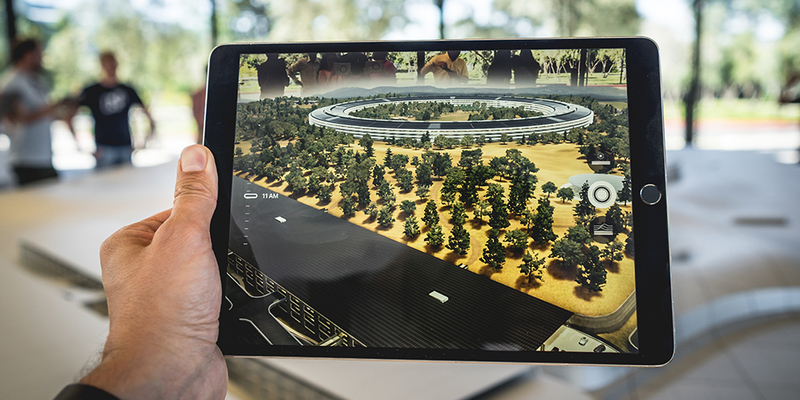 AR content can be created at lower costs and can be repurposed and reused for training employees from different functions. Training content delivered globally needs to localized according to the location. AR-enabled training content is stored on cloud allowing easier global distribution. Majority content being images and 3d modules it does not require any localization and translation; making AR-enabled training material fit for global delivery. Training is always an expensive process for the organization. In certain scenarios, AR in training can act as a cost-effective alternative. As employee roles become complex and require more skills, AR allows employees to only improve their functional skills along with their decision-making skills. Technologies evolve on a day to day basis, new technologies can always be more optimized and robust for certain tasks. Organizations need to carefully consider the investments and the returns on investment.